Ok guys I just want you to know that this cocktail seriously rocks! I am so for real about this. I made this cocktail because I had some peaches that I was about to throw away literally. One more day and they would have been too far gone (and I really, really hate to waste produce). I also had the grill out, and in 90℉ weather that’s a big deal. Think hot, sticky, humid weather and then add a 450℉ grill-not pretty my friends, not pretty. But alas, I powered through and was rewarded with this super delicious sweet, spicy, smoky cocktail. Someones gotta do it. I bet you are wondering how I still have beautiful basil in my neck of the woods. 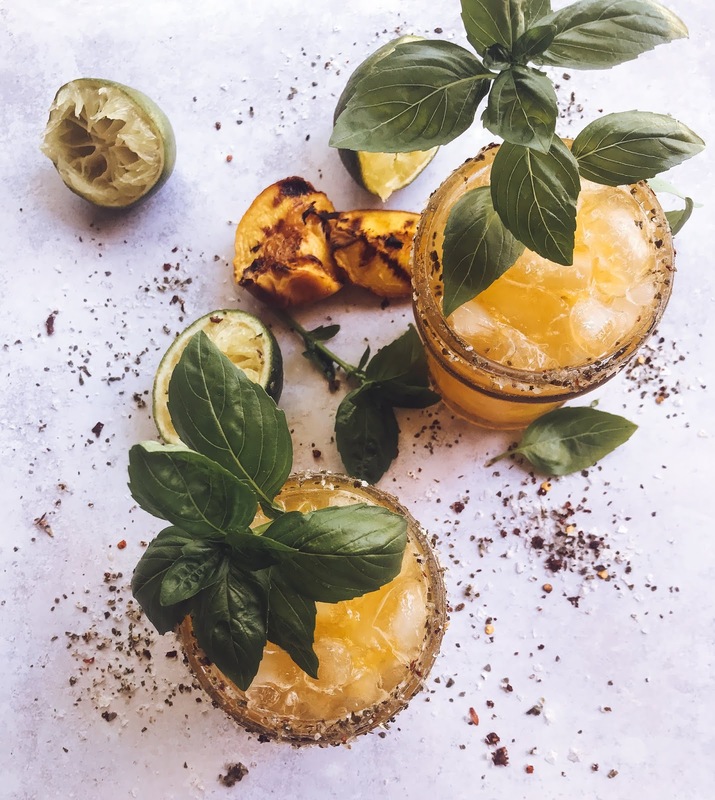 I’ve got a little gardening secret for you–every August I cut my basil, thai basil, and dill completely back and I get entirely new plants full of delicious leaves. It doesn’t start getting cool here at night until October so my garden is still somewhat thriving, if not a little wilted. Quarter the peach and brush all sides with a small amount of olive oil (to keep the peach from sticking to the grill). Grill for 2-3 minutes turning several times. 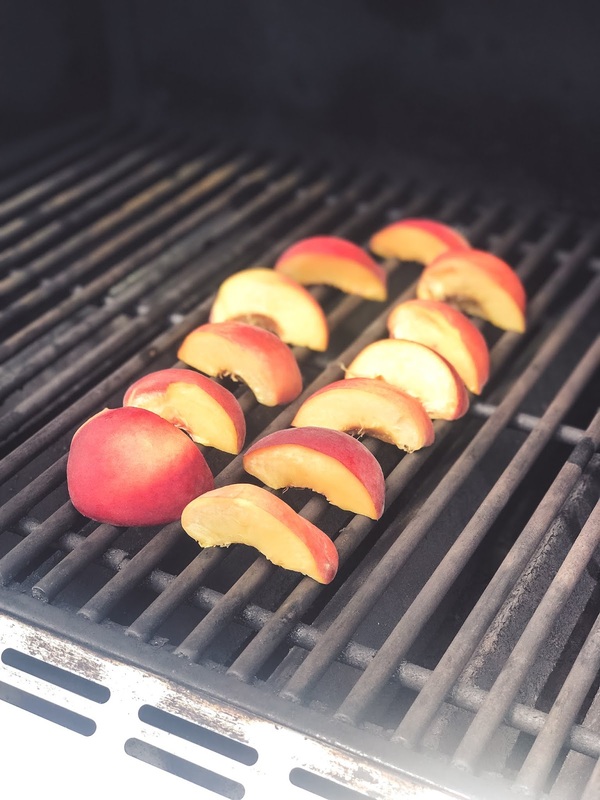 Remove the peaches from the grill and allow to cool. 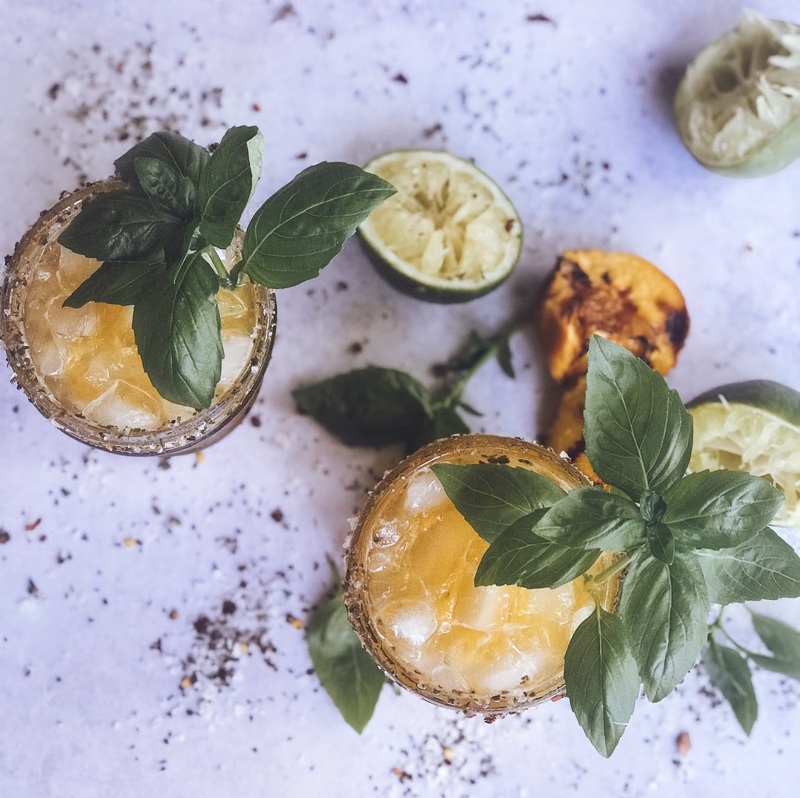 In a cocktail shaker, add the cooled grilled peach (use a spoon to scoop out the inside). Mash the peaches until smooth. Add the basil leaves and muddle. Fill the cocktail shaker with ice and add the agave nectar, Grand Marnier, and Mezcal. 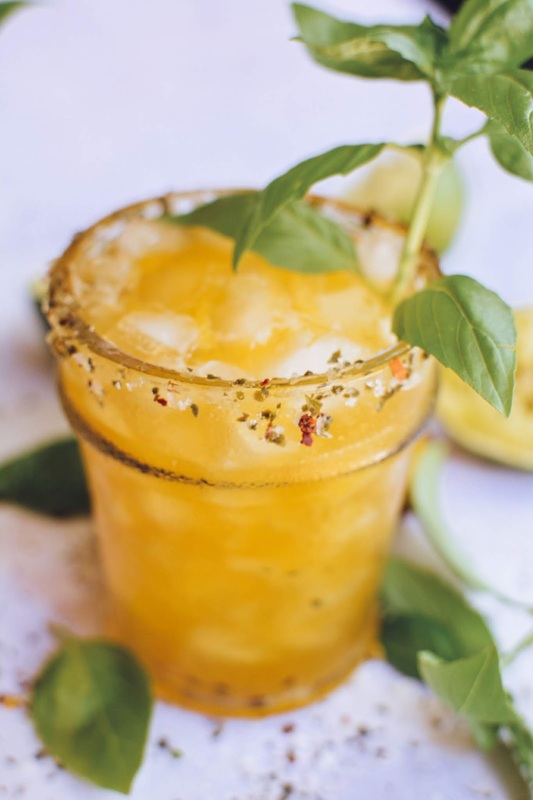 Shake well and pour into a glass filled with crushed ice and rimmed with chili salt*. Garnish with a sprig of basil. In a small bowl, combine 1/4 cup sea salt flakes, 1/4 teaspoon crushed red pepper flakes, and 1/8 teaspoon chili powder. Stir to combine.